The Midwest League announced its East and West Division All-Star teams on Tuesday, and there will be no shortage of young stars at Fort Wayne's Parkview Field on June 22. The Western Division All-Stars are led by a triumvirate of terrific hiting prospects. Burlington catcher Wil Myers (Royals), Beloit outfielder Aaron Hicks (Twins) and Angels outfielder Mike Trout (Angels) should give the West a formidable attack. Trout, a 2009 first-round pick, has been especially good this season, leading the league in batting average (.366), stolen bases (31), hits (79), on-base percentage (.444) and runs scored (49). Great Lakes Loons outfielder Jerry Sands (Dodgers) heads the Eastern Division batsmen. 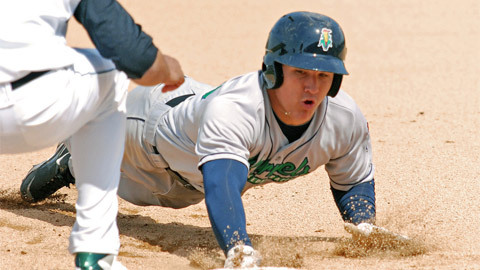 Sands leads the Midwest League in just about every offensive category that Trout doesn't. The 2008 25th-round pick is first in home runs (16), slugging percentage (.688), extra-base hits (33) and total bases (139) and is tied for first in RBIs (39). Lake County Captain Chun-Hsiu Chen (Indians), who is second to Sands in slugging and second to Eastern Division teammate Matt Davidson (D-backs) of South Bend in doubles, will also give the East Lineup a boost. Each team's pitching staff has at least one 2009 first-round pick on its roster. For the West, it is Jake Odorizzi (2-1, 3.81) of Wisconsin, the 32nd overall pick by the Brewers. For the East, there's Jacob Turner (1-3, 4.01) from West Michigan, the player Detroit made the ninth overall pick in June, as well as Lansing's Chad Jenkins (4-4, 3.48), whom the Blue Jays selected 20th overall. Cedar Rapids' Fabio Martinez (3-2, 4.10) leads the Midwest League in strikeouts with 86, and he finds himself on the West roster along with a pair of pitchers sporting sub-2.00 ERAs -- Nick Bucci (3-2, 1.74 ERA) and Trey McNutt (4-0, 1.81). Back East, comeback story Will Savage (6-1, 2.42) of Great Lakes and young lefty Giovanni Soto (4-3, 1.99) of West Michigan are key cogs on a 15-man staff. Both rosters have 31 players, and a pair of affiliates of Southern California Major League clubs -- Great Lakes (Dodgers) and Cedar Rapids (Angels) -- lead the way with seven representatives each. The Burlington coaches will direct the West squad, while the host Fort Wayne coaches lead the East. The Bees and TinCaps met in the Midwest League championship series in 2009, with the TinCaps winning in a three-game sweep. * The Midwest League announced on June 15 that Chris Owings will replace the promoted Mark Sobolewski (Lansing) as the starting third baseman for the East. Jeudy Valdez replaces Sobolewski on the roster. Also for the East, Miles Mikolas will replace Trey Haley (Lake County), who is on the disabled list. For the West, Scott Schneider will replace pitcher Tom Stuifbergen (Beloit), who is on the disabled list. Mike Kenney will replace pitcher Jeremy Berg (Cedar Rapids), who has been promoted. On June 16, Chris Kirkland replaced the promoted James Leverton (Peoria) on the West roster. Later on June 16, the Midwest League announced that Tyler Sample will replace Scott Schneider (Quad Cities) and that Connor Hoehn will replace Kirkland. On June 21, Lansing catcher A.J. Jimenez was placed on the DL. He will be replaced on the East roster by Tyson Van Winkle. Lake County catcher Roberto Perez is injured and will not play. Lansing pitcher Chad Jenkins has been promoted.